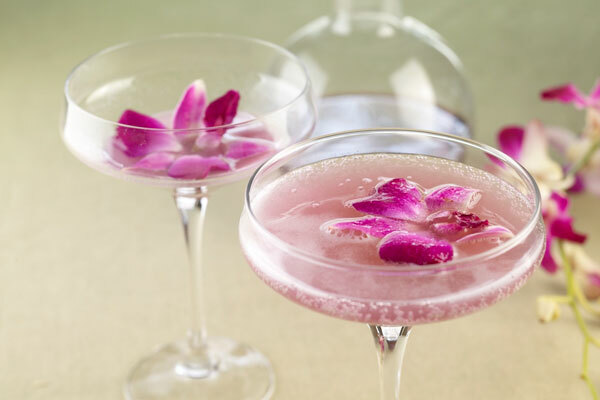 This delicate cocktail refers to the hour of midnight at the New Year. Discover what rare liqueur plays a key role in this this New Year’s Eve drink and what curious ingredient it’s made of. Discover other holiday cocktails in our collection of original recipes from the top bartenders across the nation. Chill a 7-8 ounce coupe (depicted in image) champagne glass and pour in the first two ingredients then top with brut champagne. Créme de Violette (liqueur made from French violets) was unavailable in America for about 85 years until recently. You can make your own pear puree or purchase from your local grocer. To balance the sweetness of the liqueur and puree a dry/brut Champagne is recommended. Cheryl Charming aka Miss Charming is one of America’s top mixologists, cocktail celebrities, and rockstar bartenders. Her current claim to fame is having the most published bar and cocktail related books. She gained the bulk of her experience on a Caribbean cruise ship and at the wonderful world of Walt Disney.